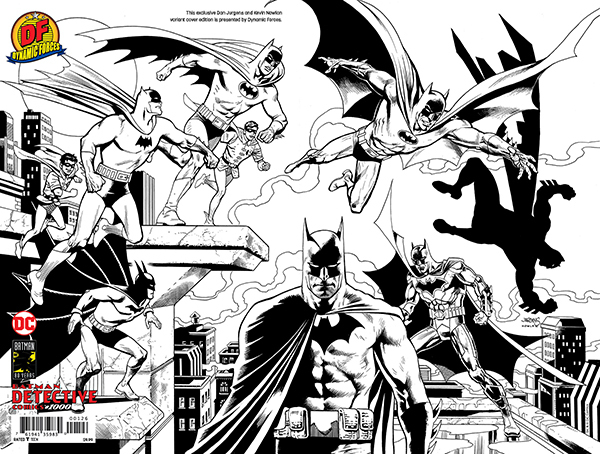 DYNAMIC FORCES® - DETECTIVE COMICS #1000 DYNAMIC FORCES EXCLUSIVE WRAPAROUND ART VARIANT COVER BY DAN JURGENS AND KEVIN NOWLAN VIRGIN BLACK AND WHITE PURE LINE ART EDITION! ULTRA LOW INTRO PRICED FOR ONE WEEK ONLY!!! 02/06/19 THROUGH 02/13/19!!! After 80 years, it's here-the one thousandth issue of DETECTIVE COMICS, the title that literally defines DC! This 96-page issue is stacked with an unbelievable lineup of talent that will take you on a journey through Batman's past, present and future...plus a sensation epilogue that features the first-ever DC Universe appearance of the deadly Arkham Knight! But who is under the mask? And why do they want Batman dead? The incredible future of Batman adventures begins here! Dan Jurgens and Kevin Nowlan created, in our opinion, one of the best Detective and Batman covers of all time, spanning 80 YEARS of Batman History paying homage to all of the great artists over 8 decades, and we wanted to show you the PURE Line art created by Dan Jurgens and Kevin Nowlan, so in showcasing the beautiful art, it is only available as a Virgin Cover Black and White Pure Line Art Edition!